His name isn’t MacGyver, but a motorcyclist showed similar unconventional problem-solving skills to save the life of a puppy that almost drowned. Hoang Minh, 21, was riding his motorcycle along a road in southern Vietnam when he spotted the unconscious puppy floating in a river. 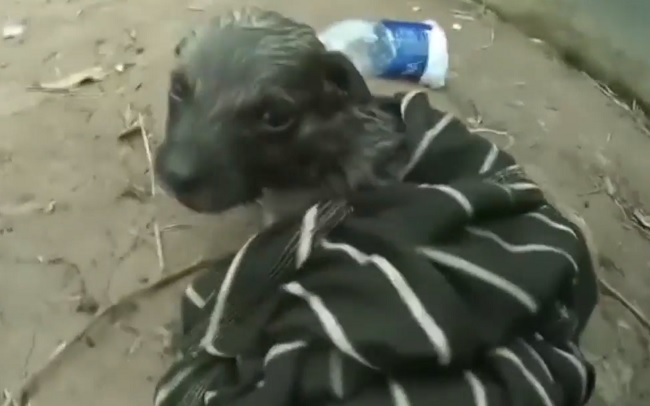 He immediately stopped and pulled the puppy, whose body was still warm, out of the water. With his helmet camera turned on, Minh vigorously rubbed the puppy’s belly in an effort to revive him. He wiped the puppy’s face with a tissue and checked inside his mouth to make sure he hadn’t swallowed his tongue. So far, so good. Minh then cut off the bottom of a plastic water bottle and lined it with a tissue. He placed it over the puppy’s head while breathing into the neck of the bottle. His ingenious makeshift device worked. After just a few breaths, the puppy stirred and opened his eyes. He was soon up on his wobbly feet. Should you ever have to revive an unconscious dog and there’s no water bottle nearby, you can perform artificial respiration by holding the dog’s jaw tightly closed and breathing into his nose. For smaller dogs, you may be able to cover both their nose and mouth with your mouth and breathe into them. Here are the recommended step-by-step instructions to follow from petMD.com. The puppy’s whereabouts are unknown, The Mirror reports. Here’s hoping Minh, the hero who saved his life, is now his official dog dad.